If social media was a person living in Bucharest, there has been created an event where she could go on stage, in the highlights, so that people could gather around and stare at her unique combination of professional, colloquial and somewhat fashionable glare. 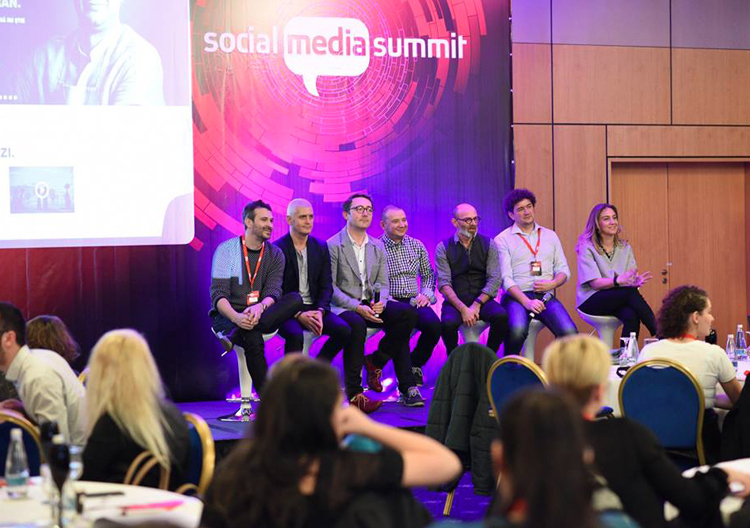 This was called the “Social Media Summit”, and the 2016 edition took place on February 19, in a precocious spring day, under the tag of #SMS2016. This annual conference was put up in order to get to better know what’s happening in the Romanian realm of social media. That means mostly Facebook, followed far behind by a slow-but-steady runner LinkedIn, the renowned-but-falling-behind athlete Twitter and a growing Instagram. Speakers focused on what have been the most effective strategies that worked in the previous year and what will shine in the next. Who was in the room? Specialists from companies and PR agencies, marketing and sales experts and also bloggers – they all come together in this picture. The role of social media increased in the past years, as they enhanced (at least that’s what they say) the interaction of people and the companies who’s products they buy. After all, more and more people join the platforms, and companies follow them closely. Last year, in Romania, there were 3 million readers of blogs and 8 million active accounts on Facebook. Social media plays an increasingly important role in society and in corporate communication (less expensive, too… in theory). The recent increase of exposure of social events, of companies who chose to develop their communication and political events that gather force in the social media universe come to support this approach and the power of these tools, when used with skill. Truth be told, social media is far from being free or easy to manage. A bad review or complaint on Facebook can lead to real challenges. If you lack quick reactions, that will build up as more people react and could become a crisis. So PR has a lot to do with this. Also because even when the waters are chill, investment is needed in order to get meaningful, lasting results, not just likes. Most professionals who manage social media accounts work with concepts as strategies, planning and integration just like any other manager. Because one thing’s for sure: social media cannot work without real-world facts and it cannot be just a side-job, when it comes to [large] businesses. Like banks, for example. 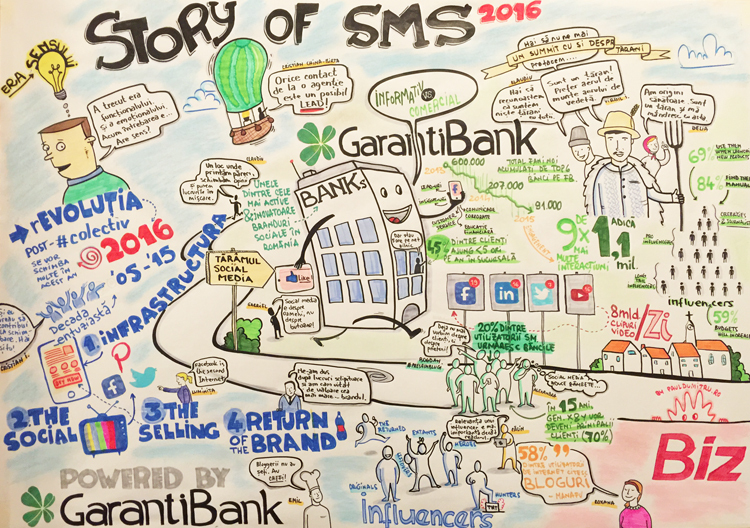 Come to talk about it, it was a bank that called me to graphically record the contents of #SMS16 in a comprehensive overall canvas. What’s surprising to me is that 20% of Romanians on social media follow banks, although half of them step in a bank less than 5 times a year. 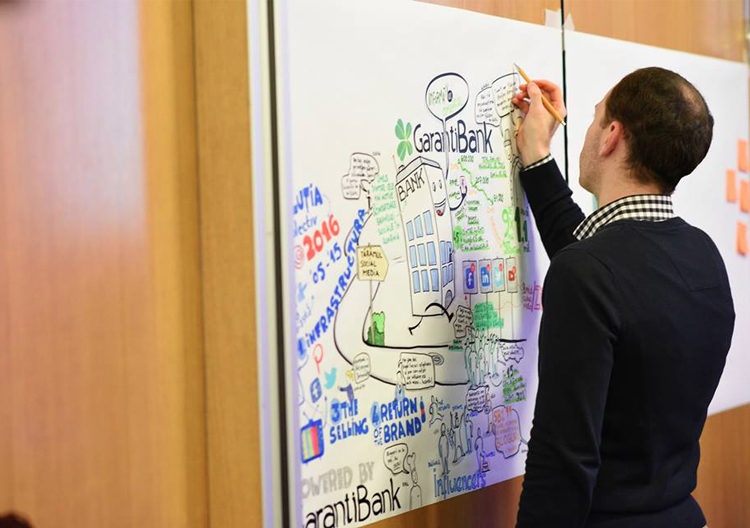 An important reason why people follow banks is that they are one of the most active and innovative organisations in social media. They use this channels for leads, insights, offering customer service, corporate communication, financial education and, most important, for balancing the ongoing conversation between informative and commercial. After all, they have to find ways to adapt, since the engagement of people decreased as the years passed, despite more and more are joining in each moth. The question of the summit was: where is social media thing going? Will brands be able to compete with the curve of change? It remains to be seen. These days there are around 8 billion videos being uploaded on youtube each day, and the era of functional and emotional content is being replaced by the era of “making sense?”. If it doesn’t “make any sense”, it’s useless, boring, unattractive. Of course, no one knows for sure what the next “social media era” is gonna be like. So the main idea is, unsurprisingly, adapt to whatever comes your way. That might very well lead to establishing a whole social media department in some companies, indeed, but who says that keeping clients close even when they don’t enter your store for months isn’t worth a couple of bucks now and then? Does it make any sense?